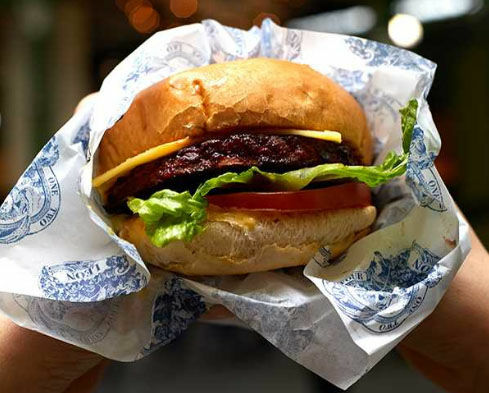 WASHINGTON — London-based fast food chain LEON, which opened its first U.S. location last year in Washington Square at 1050 Connecticut Ave. NW, is putting a plant-based burger on its D.C. menu. The LOVe Burger is made from 100 percent plants and is the first of several new vegan items LEON will add to its menu this year. It is made with a soy-beetroot patty and is topped with a vegan Carolina mustard mayo and a slice of smoked Gouda-style vegan cheese. Next up for LEON’s only U.S. location in the District will be its meatless meatballs, already on its U.K. menus. LEON’s Mediterranean-leaning menu includes options like falafel wraps, chicken, basil and pine nut salads, crushed pea salad, and smoked salmon and avocado egg pots. The chain calls itself the pioneer in “naturally fast food.” It has grown to 63 locations in the U.K. Norway and the Netherlands since 2004. LEON will open its second U.S. location, also in D.C., at 655 New York Avenue this spring.